Square-Enix CEO Yoichi Wada is frustrated with Japanese gamers' refusal to give Western-made games a chance, calling the Japanese term for the games "terribly discriminatory." 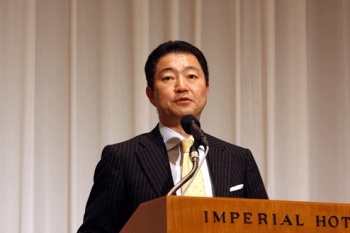 The relationship of Japan and the West when it comes to video games is a strange one, and Square-Enix CEO Yoichi Wada has spoken at length on the subject more than once. Wada clearly admires the Western game industry, mentioning that he wants to see his native Japan follow suit with more games made for adults, and - like many other Japanese developers - has obviously been mulling over how Japanese game makers can market their titles to Western gamers more successfully instead of dealing with a relatively small, insulated market. But for the moment, Wada isn't concerned with how to market his company's games in the West, but with the exact opposite: In an interview with Japanese TV posted to YouTube, Wada expressed frustration with Japanese gamers' resistance to Western titles, in part due to the country's collective "meh" to Modern Warfare 2, which Activision handed off to Square-Enix to publish in the Land of the Rising Sun. Specifically, Wada has an issue with the Japanese term youge- (洋ゲー), the word used to refer to titles made in the West as opposed to Japanese-made games, or geimu (ゲーム - yeah, it's just the word "game"). By differentiating between the two, Japanese gamers are essentially saying that Western games aren't actually games, and the Square-Enix boss doesn't like it. "Even now, there have been people in Japan using the label youge- (Western games) with a terribly discriminatory meaning," said Wada. "I'd like them to try it once. If they play it once, they'd realize how incorrect that label is." There's no doubt that Wada has a bit of a personal investment in the matter considering that strong sales of MW2 would benefit his company's coffers, but considering his previous statements on the matter it's not hard to believe that the man genuinely wants Japan's gamers and game makers alike to broaden their borders in more ways than one.